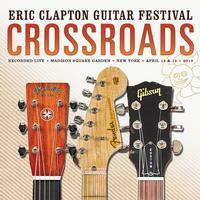 2013 two disc collection containing highlights from Eric Clapton's celebrated music festival. In addition to rousing performances of blues classics and renowned hit songs, many of the most memorable performances saw artists coming together for some stirring collaborations. Among the highlights were the surprise pairing of John Mayer and Keith Urban for the Beatles' "Don't Let Me Down," Vince Gill and Clapton taking on "Lay Down Sally," Keb Mo and Taj Mahal covering the Sleepy John Estes' song, "Diving Duck Blues," Gill performing "Tumbling Dice" with Urban and Albert Lee and members of the Allman Brothers - Gregg Allman, Warren Haynes and Derek Trucks - joined forces for a haunting acoustic cover of Neil Young's "The Needle and the Damage Done." As you would expect, Clapton features prominently throughout the show. The legendary guitarist also tore through the Derek and the Dominos' classic "Why Does Love Got to Be So Sad" with the Allman Brothers Band, revisiting the time in 2009 when he joined the band during their annual residency at the Beacon Theater in New York.